Welcome to Our History Project. We began our journey in 2009, and I am excited to say that we are still going strong. Our Staff and Members have made a huge impact across our Country with presentations, demonstrations, reading, reviewing, hammering and cleaning. We have provided support to historic preservation projects, museums, schools, and archaeological surveys at the local, State and Federal levels. While I get a wide range of answers each and every time, what it boils down to is: History is “His Story”. It his “Her Story” and it is “Our Story”. It is an oral tradition that is supposed to be spoken and shared and that is what we are about. Have you ever heard of the King Philip’s War, The Pig War (not the Bore War)? Ever hear of John Ledyard, Bob Slaughter, John Vaughn or Jake Donelson? If you look around our site and click some audio buttons, you will. In the past our main purpose was spreading the word through radio and podcasting and you will find over 400 hours of programing here. We have changed directions somewhat in the past few years to be more hands on. Our Mission and Vision has never changed; “Preservation and Education” is still the focal point of our being. If you are looking for speakers or need anything specific, contact us. I am sure we can help. Question: There are two (2) Presidents in the above photo, can you name them? 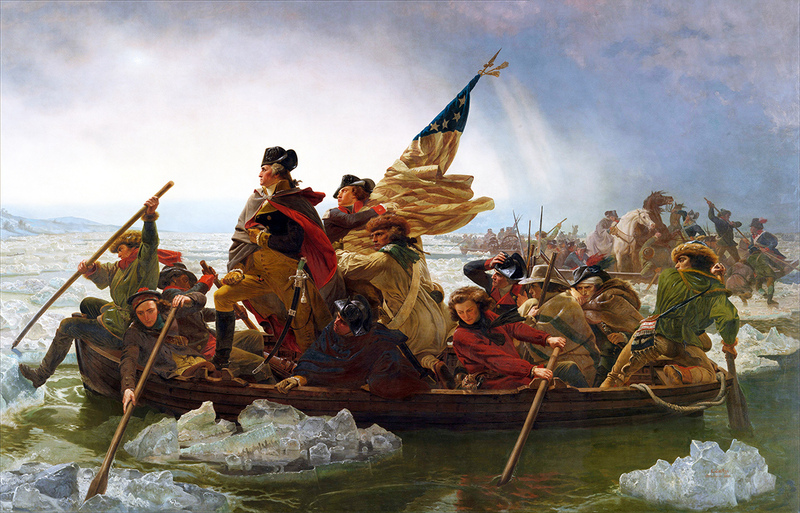 Answer: George Washington (at the helm) and James Monroe (holding the flag). That is just one unusual fact about this painting. To find out more, click the image to make it full size, and look really good at all the people in the boat. When done go over to Military History Now for an excellent article on the painting. Question: Did Lewis and Clark blindly explore the American wilderness or did they just follow the map? Answer: More than likely, they followed the map and had a pretty good idea what to expect. Believe it or not before the expedition left the safety of the known English World (former British Colonies) in 1805 there was a good source of maps available from the French and Spanish. Primarily the Henry Popple Map published in 1746 in England, which was a revision of the original 1733 version. Click on the map on the left and it will take you to the David Rumsey Map Collection and this map. You can zoom in and explore for yourself what was known and what was not. This map by Robert Wilkinson published in 1804 a year before the expedition was under way is provided to further illustrate that even the unknown areas were known. Take note of the text just under the Columbia River on the West Coast saying that the Indians of the area have over 100 towns and sailing in large vessels. On behalf of Our History Project. I would like to say thank you to our ongoing members and your support! We have made it another year and will continue working in communities all across our Nation. For those of you new to OHP, we invite you to become a part of our commitment to saving and sharing our United States History. Your donation of any amount will go directly to supporting activities, lectures, work and preservation projects that our staff, volunteers and historic professionals. Through grateful donations our administrative cost has been covered for the next several years (THANK YOU!). So now any and all amounts donated will go 100% back to the community. Sign up to become a member today! Your $25 could make a difference in the classroom. USS Constitution vs HMS Guerriere August 19-20, 1812. Artist James Hardy lll. Would you like a speaker to come to an event, school, organizational meeting or some other function? Do you have a book you would like reviewed? We are on most publishers lists, but if you are a Self Published or Publish on Demand Author we may never see it. Do you have a project request? Sunrise at Antietam. Photo courtesy of the US Park Service. All Images contained on this site are the property of the respective creators. All radio broadcast are the property of OHP Radio and Our History Project, Inc, all rights are reserved and you may not published or re-broadcast with out permission, which can easily obtained by filling out the request form.